I'm so happy that it's finally springtime. The weather is getting warmer, my return to Denver is drawing nearer, and there's Easter candy in the grocery stores. What's not to love?! 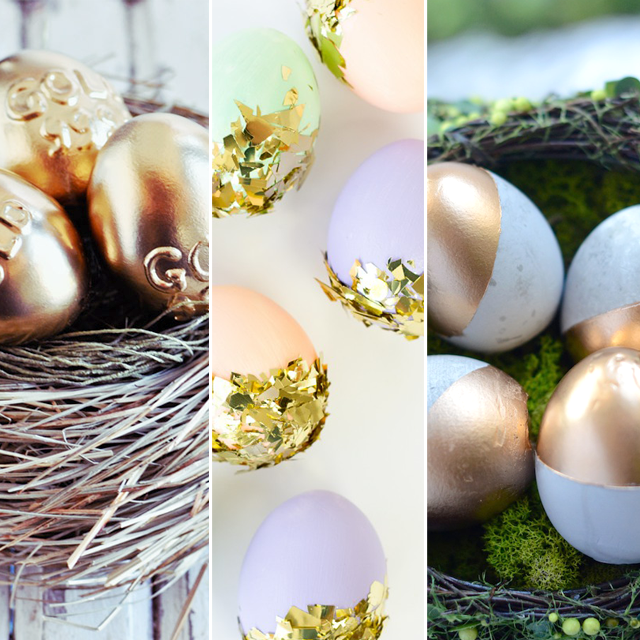 I'm also enjoying all the ways that gold has crept into the latest Easter egg decorating trends. Go Make Me has a tutorial for using 3D paint and spray paint to make totally believable-looking gold bullion eggs. Kelly is embracing the confetti over at Studio DIY with her flashy confetti dipped easter eggs. And for the adventurous egg decorator, Camille Styles has instructions for cement easter eggs that you can use year after year. What are your egg decorating plans this year? Whatever they are, happy dying, dipping, and spraying! I've never decorated eggs for Easter. Love these ideas though! Thank you very much for visiting my blog. I really appreciate that!